Electromobility – How Much Extra Capacity Do We Need? There are plans to electrify the transport system. Electric cars will, according to some futuristic scenarios, soon populate our roads. Car makers are quickly developing the needed technology which so far has not left its infancy stage. Nevertheless, there is room for improvements and technological progress. Perhaps we will see a significant number of electric autos on the road withing a decade or two. Germany wants to have have 1 million electric cars by 2020. Let us imagine a world where all fossil-fuel driven cars have been replaced by electrical ones. In addition, we may suppose that people have not changed their driving habits, i.e. the number of km driven per car is not lower than it was during the gasoline and diesel era. Thus, the energy needed for transport purposes is more or less the same for electrical or conventional cars. From this we may estimate of how much extra capacity we need in order to generate the electricity that is supposed to power the vehicle fleet. Given the current structure of the energy grid it is pretty obvious that the existing generation capactiy for electricity will not be sufficient to supply the required energy for an entirely electrified auto world. Let´s look at the European figures first. In 2007, road traffic accounted for a final energy consumption of 309 Mtoe. This is equivalent to 3600 TWh. Taking into account efficiency gains, since electric engines are more efficient than combustion engines, we may estimate the final consumption in the electric world to 1800 TWh. This corresponds to 63% of total EU final electricity consumption in 2007. Thus, production capacity must be upgraded accordingly if we want to have electric cars only on the road. But how much extra capacity is needed? A top-performing nuclear power plant may produce some 10 TWh per year. From this we may conclude that about 180 extra nuclear plants may fill the energy gap. It goes without saying that this is not a very likely scenario, given that countries like Germany and Belgium are planning to abandon nuclear altogether. For other countries like Austria, nuclear is not an option in the first place. There may be plans to build new capacities in some European countries, like in Finland. However, nowhere do we get near the requested capacity. 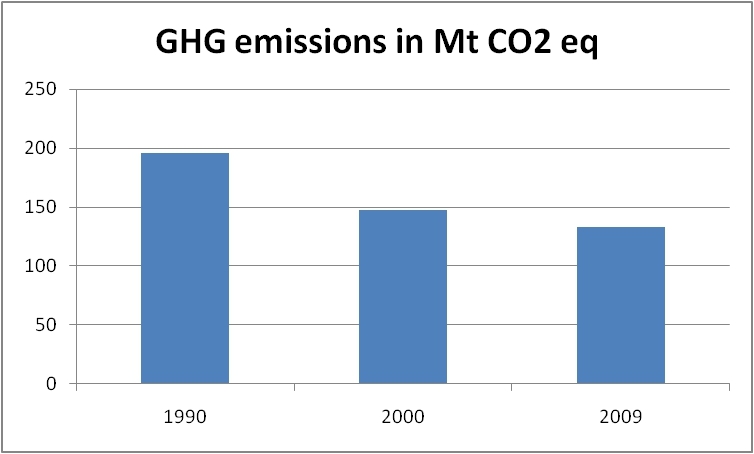 Likewise coal-fired power plants are not an option due to their greenhouse gas emissions. So what about renewable energies? Let us take the Desertec initiative as a reference point. It is a gigantic proposal supposed to transmit in 2020 some 60 TWh of electrical energy from the north African desert to Europe. This amount of energy, however, is about a factor 60 short of what is needed (1800 TWh). Even the anticipated transmission volume of 700 TWh in 2050 falls short of the electricity needs for full electromobility. Thus the challenge is much bigger than we may think of in our most optimistic dreams. Even a full-scalce Desertec facility will not be able to provide sufficient energy for an electrified transport scheme. Traffic requires even more energy resources in the US. According to the US Energy Information Administration (EIA) in 2007 about 27 763 Trillion Btu were used for transport purposes only. Correcting for non-road traffic (mainly air transport, water transport and rail) about 20 000 trillion Btu went into vehicle transport. Translating this into electrical units and accounting for efficiency gains as above leaves us with some 2900 TWh which would be needed in order to put the entire US vehicle park on an electrical basis. Not surprisingly, the respective requirements are even more challenging than in the European case. It goes without saying that similar arguments apply for Asia, Latin America and Africa. The effort to embark into electromobility is tremendous. 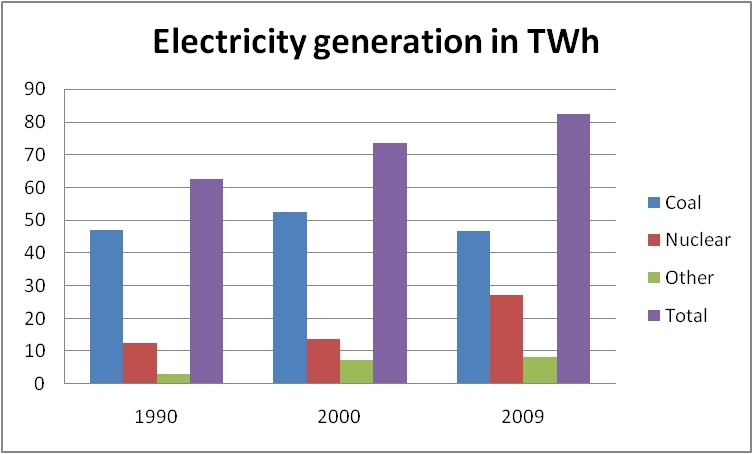 In any case, a massive extension of electricity generation capacity is unavoidable. Renewables are gaining ground in Europe and beyond. When talking about renewable energies most people think of solar cells and wind turbines. These are certainly the most prominent examples of energy sources which are supposed to be both, non-polluting and sustainable. However, that is not the full story. There are other renewables, too, contributing their share to the energy mix. One of them is biogas which, from a public point of view, is heavily underrated. In Fig. 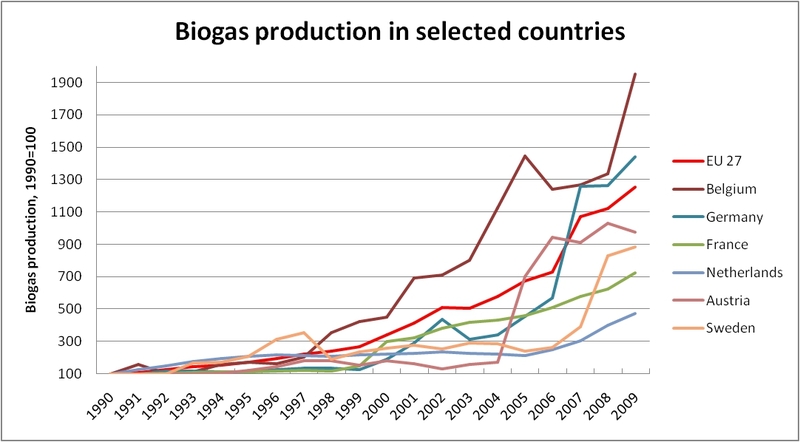 1 we see the development of biogas production in some selected European countries between 1991 and 2009. Some of them have developed extremely well during that period. All of those countries had particular years with outstanding performance. Of course, it is not possible to keep excessive growth rates of 60% or more over more than one year. The figure shows the percentage increase of biogas production with respect to the previous year. All raw data have been taken from Eurostat. Summing up the changes over the period in question yields yet another picture (Fig. 2). Now we can see how production output climbed by a factor of almost 13 on EU average between 1990 and 2009. Some countries like Belgium and Germany have succeeded in outperforming the mean EU growth in the recent past. Both of them are likely to increase their production level in the near future. As both countries are determined to phase out nuclear within the next 10 to 13 years, biogas appears as one of the potential substitutes. The growth rates are obvious. Yet, some countries like Austria saw a decline in biogas production in 2008/09. This, however, seems to be a temporary feature only. Other countries too, like Germany in 2002/03, have seen phases of reduced energy production which were followed by a subsequent rise in biogas output. These figures show the situation in countries where biogas has already a certain tradition. In some other parts of Europe, like Bulgaria and Romania, biogas has come to life less than 5 years ago. We may therefore expect a large potential for that energy source in these countries in the near future. Energy prices are a crucial factor for industry and business. They have a great impact on both competitiveness and productivity. At European level energy prices, in particular for gas and electricity, are monitored by Eurostat. Their data reveal a number of interesting aspects about the energy market in Europe. In the figure below we have selected some countries showing significantly different price levels for electricity for industrial consumers. 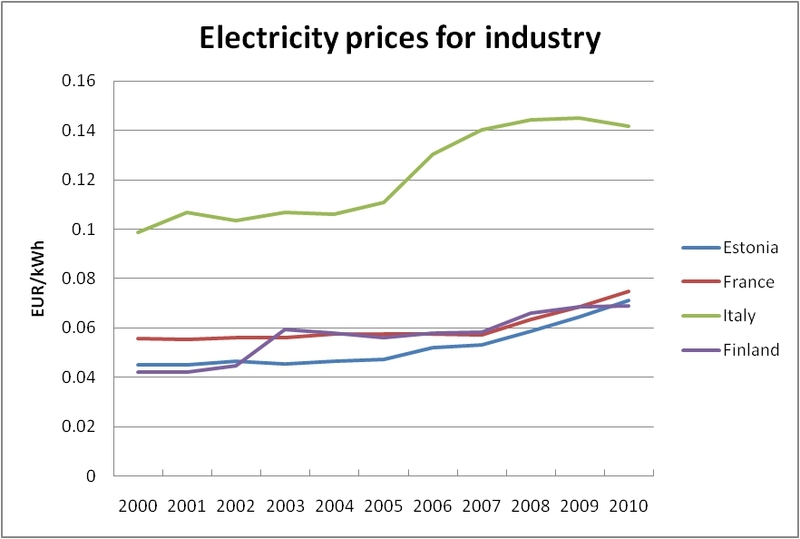 Electricity prices for industrial consumers in Europe. Italy is a good example for electricity prices well above the EU average which in 2010 was 0.105 EUR/kWh. For the Italian industry electricity is therefore about 35% more expensive than for the average industrial consumer in Europe. Finland, on the other hand, is one of the cheaper places of the continent with its price level being almost 35% below average. France is also among those countries with relatively low electricity prices for the industry. Its electricity bill is significantly lower than the one for German (0.115 EUR/kWh in 2010) or UK (0.995 EUR/kWh in 2010) consumers. The introduction of a carbon tax would affect those countries in very different ways. Especially Germany and UK might feel its consequences, since their energy mix contains a large proportion of coal-fired power plants. France, on the other hand, with its very strong nuclear sector would be affected to a much lower degree. Paving the Way for Electromobility? Electric cars are considered carbon-free. Although, strictly speaking, this is not correct, since their production requires a substantial amount of CO2, we may nevertheless consider them a more carbon-friendly alternative to the classical motor vehicle. One of the key issues with electricity-driven vehicles is their competitiveness with regard to conventional cars. And here the prospects are not too shiny, at least for the time being. Clearly, there is room, plenty indeed, for development. The Achilles´ heel of the electric car is its battery which is heavy, takes a lot of space in the trunk and enables the driver to go about 150 km before recharging again. The latter process takes several hours, but may be speeded up to something like 20 minutes or so. Comparing this to the respective data for a classical vehicle is no incentive for excessive optimism. A gasoline or diesel driven car may go easily up to 1000 km without refuelling, and stopping at the gas station would normally take not more than 5 minutes. Obviously, with these performance data the electric vehicle is no serious competitor to the conventional one. How to overcome these difficulties? Apparently, everything depends on the battery, its weight, its capacity and the time needed to recharge it. One may, however, question if it ever will be possible to go 1000 km before approaching the next plug? Surely, nobody knows what will be the state-of-the-art in 10 or 20 years from now. Or has anybody thought about the performance of an iPhone ten years ago? So there is indeed room for surprises, but also for disappointments. An example for the latter is the continuous research effort on nuclear fusion which, although ambitiously driven for several decades, has not led to any viable economic output so far. One possibility to get rid of the drawbacks of excessive battery weights is changing the supply mode altogether. Instead of carrying a heavy battery on board one might think of electrifying the road network. Via a special transmission mechanism the cars could get their power directly from a built-in electricity grid. For the time being it seems, however, exaggerated to electrify the entire road network. But what about having only the motorways with a built-in recharging facility? In Europe, more than 85% of the population live within less than 50 km from a motorway. Thus, drivers would need the battery just for getting to the next motorway and then could connect to a specially designed supply system. This, in turn, could reduce the size (and weight) of vehicle batteries, thereby leaving more space for transporting items or people. But what about costs? Implementing such a system would essentially mean rebuilding the entire motorway grid. And building motorways is expensive. A (very) conservative estimate says that each km would cost a minimum of 6 M€. Thus, electrifying the complete motorway infrastructure in Europe with a total length of 65 000 km would, according to our approach, amount to some 390 billion €. The real costs, however, might be significantly higher. In addition, due to its higher complexity, the new motorway network would certainly require higher maintenance costs, putting additional burden on public finances. In 2000 the World Bank estimated the average maintenance costs for paved roads to be somewhere between 20 000 and 200 000 USD per km. This figure is bound to rise for an electrified roadwork. Is it worth the effort or might it be more sensible to use biofuels or fuel cells instead? Heating degree days (HDD) may serve as an indicator for the amount of energy used for heating purposes. The correlation seems to be pretty obvious: a larger number of HDD should inevitably lead to a corresponding increase in energy consumption. This relationship should, as a consequence, be reflected by the amount of primary energy used. Of course, heating is not the only way to consume energy. Traffic, industrial production and services equally request their share in primary energy demand. In Germany, heating accounts for about 30 % of total final energy consumption. Thus, if the number of HDD is up by, say, 10 % then we would expect the consumption figures to increase accordingly. The question is to what extent the latter would reflect changes in HDD. Let us demonstrate this via a simple thought experiment. Imagine Germany consumed 100 units of final energy in 2009, 30 of which were used for heating. The number of HDD was x. In 2010 HDD increased by 10% compared to the previous year. Thus we would expect a total of 33 units being absorbed for thermal comfort. Everything else remaining unchanged, the total final energy consumption in 2010 would amount to 103 units. Thus, the total consumption figure would be up by 3% in 2010. Does this argument also hold good for primary energy consumption? Let us have a look at two countries of similar size and climatic conditions, namely Germany (Fig. 1) and UK (Fig. 2). The source data have been taken from BP Statistical Review of World Energy 2011 and Eurostat. The figures show primary energy consumption per capita (CPC) in tons of oil equivalent (toe) and the number of HDD in the respective country. Consumption figures in Germany reflect changes in HDD only partially, as expected. At the end of our observation period we even note that a significant rise in HDD is met by a slump in consumption per capita. Between 1994 and 1996 HDD went up by more than 27%. The respective rise in CPC was a mere 3.3%. The UK data are as follows. Again, the changes in consumption per capita are much less pronounced than the respective variations in HDD. 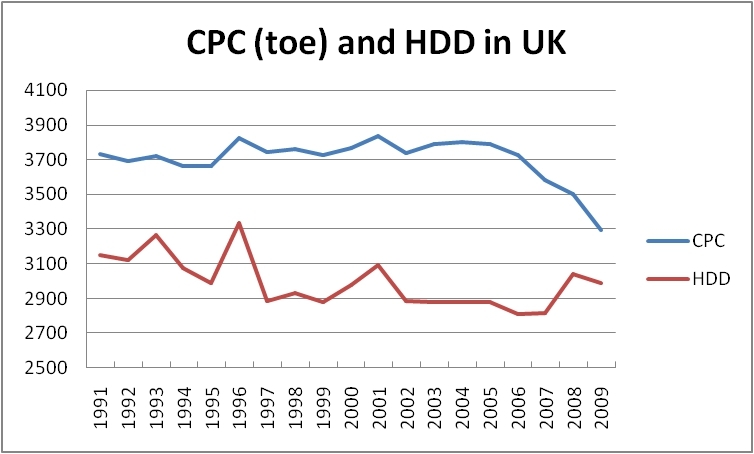 In 1995/96 HDD increased by some 11.5 %, whereas CPC went up by 4.5 % only. 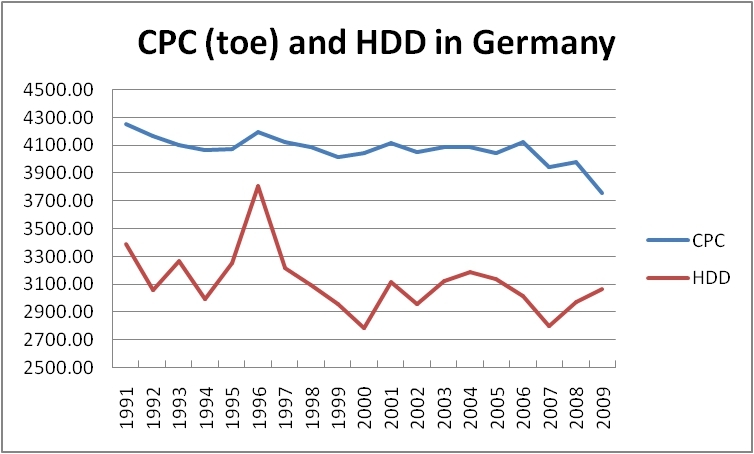 As in the German case, towards the end of the obervation period a clear upward trend in HDD is met by a significant drop in CPC. Heating degree days have certainly their merits when it comes to estimating energy needs for thermal comfort. However, on a more global scale, their usefulness is relatively limited. In any case, their importance should not be overrated.